Natural and sustainable cork isn't just for wine bottles and bulletin boards, it also makes these cool new Juliska Quinta Cork Candlesticks from designers David and Capucine Gooding. 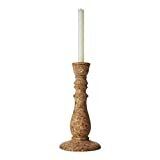 These unique candlesticks are crafted from hand-carved cork in Portugal that is naturally water tight and flame-resistant and come in either 8" or 11.5" sizes. The perfect way to add a little romantic illuminated dining ambiance while sharing a bottle of wine.